This tutorial was written using the artwork of Keith Garvey and my kit BOO which you can purchase and download HERE PSP x2 was used for this tag, but if you have working knowledge of PSP, then any version will do. Let's get started! 1. Open a new image 600 x 600 , tick transparent box. Open Scatters, copy and paste as new image. Delete original. Resize scatters to 85%. Copy and paste onto the new image as new layer > layers> merge visible. From this point forward, new image is known as tag. 2. Open doodle. Copy and paste on left side of tag, one pixel square down from top and in first pixel square on the left side of tag. Effects> 3D effects> drop shadow. ( settings: offset vertical 2, horizontal 1, opacity 100, blur 2, color black). Delete original element from psp. 3. Open Moon. Copy and paste as new image, delete original. Adjust color now if desired. Resize moon down to 50%. Adjust> brightness/color > clarity. Copy and paste onto tag in right upper corner. 4. Open frame 3. Open paper 5. Copy and paste both as new images and delete originals. using the magic wand tool, click inside frame over all areas including inside swirls. Click on paper 5, copy. Click inside frame> right click and paste "into selection". Make sure all areas inside frame are covered with paper 5. Selections> selections none. Resize frame to 80%. Adjust>brightness/color> clarity. Copy and paste the frame onto the tag "as new layer". Effects>drop shadow>Layers> merge visible. 5. Open beads. Copy and paste as new image, delete original. Resize beads to 85%. Copy and paste " as new selection" onto tag at base of frame as shown. Drop shadow. Selections> select none. 7. Open Happy Halloween word art. Copy and paste as new image, delete original. Resize word art to 65%. Copy and paste onto tag "as new selection" and position as shown. Effects>3d effects> drop shadow>selections>select none. 8. Open bats, copy and paste as new image, delete original. Resize bat to 25%. Copy and paste onto tag " as new selection" and position where desired or as shown. Selections> select none. 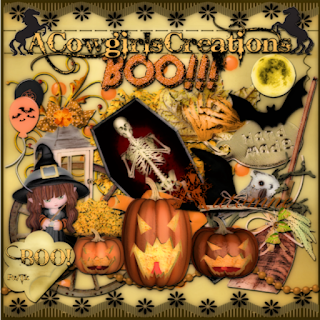 Don't forget to add artists credits and you must also credit me "KitbyACowgirlsCreations"
This tag and tutorial were created by me October 28, 2017. Any resemblance to any other tag or tut is strictly coincidental. Do not copy this tutorial and claim as your own. Do not hotlink to any site. Do not upload my kits to any site. Do not hotlink my kit to any site. Do not take apart my kit and claim any element or part of it as your own.